Post by Wynette: Charlie posted earlier about our hike around Capri where we had a long long stretch of nothing but stairs. I think they went on for at least 1/4 mile, probably more. All uphill on steep steps, no handrails to pull yourself up with or balance on. (Deb, yes, come to think of it, it was very much like hiking up out of the Grand Canyon. But, thank goodness I didn’t have a backpack. And it wasn’t as far! And I was careful not to pick up any rocks. 🙂 We’ve encountered lots of stairs on this trip. Below is pic of stairs to our current B&B. This is only about 1/4 of the total stairs for this. But, I’m getting stronger and they aren’t really bothering me too much. (I think my knees are better now than in previous years.) 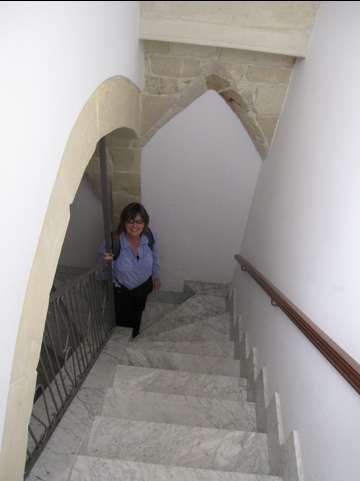 Our landlady, Renata, told us how good stairs are for us.